Back to the fried chicken. 🙂 I found a pack of chicken drumsticks in the fridge. 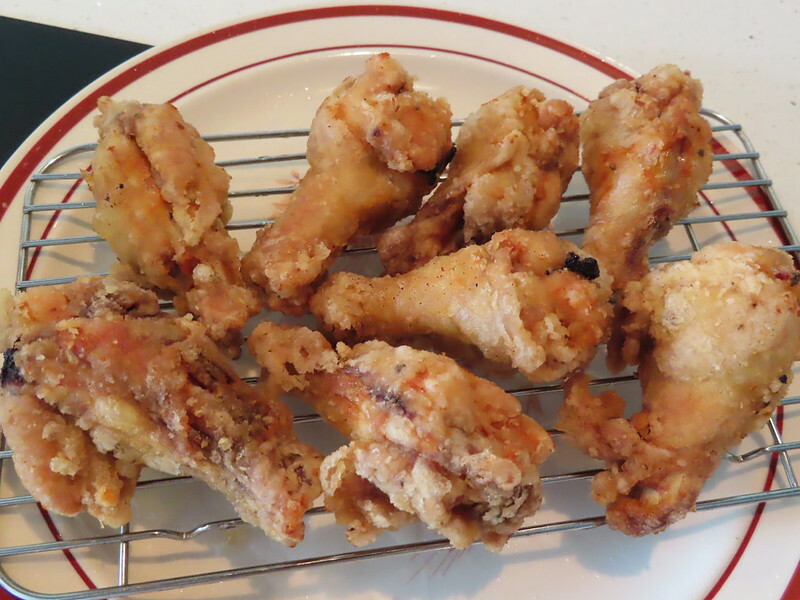 To me, chicken drumsticks are ideal to cook fried chicken. Since they are not so skinny as chicken wings or not so hard-to-cook as chicken legs. Wash chicken drumsticks (my pack contains 8 ) clean and drain them. Put all the drumsticks in a big bowl. Sprinkle 1/2 tsp salt and 1/2 black pepper. Also chop a small piece of ginger and add in. Mix them well. Roll drumsticks in potato starch. Let each one be coated with a thin starch layer and shake off the excess. Prepare frying oil. I didn’t measure the temperature of the oil. I just grab the bone end of one drumstick and slightly dip it into the oil. If a lot of bubbles show up around it and you can hear the sizzling, the temperature is OK. Gently slide the drumstick into the oil. For the whole frying process, I keep the low-medium heat. 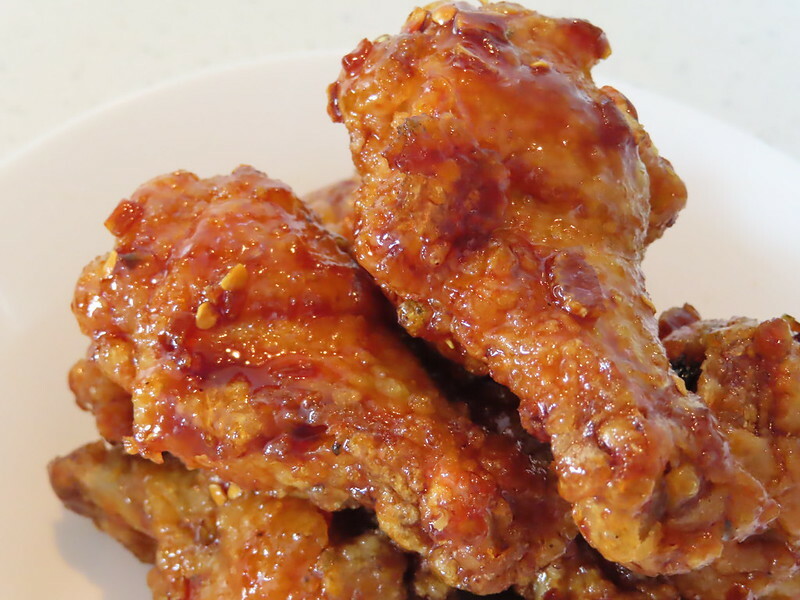 To make sure chicken is cooked thoroughly, frying may take 10-13 mins. Heat up the oil and fry again to get crispy out layer and golden brown color. After frying twice, the outside shell is very hard. Heat a pan. Add in 1/2 tablespoon oil. Saute 2 or 3 chopped garlic cloves. If you want your chicken to be spicy, add in a little chopped dried chili. Then add in 1/4 cup soy sauce, 1 1/2 tablespoon honey and 1 tablespoon vinegar. Turn to low heat and reduce the sauce a bit. Add all fried chicken into the sauce. Stir to mix them well. 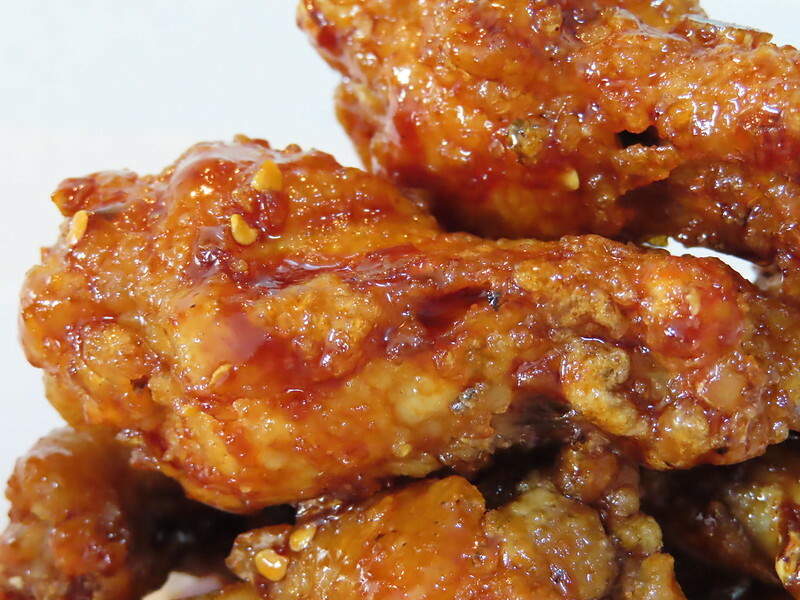 Chicken will be coated with sticky and shiny tasty sauce. My husband cannot stop licking his finger. “Actually, most time I just ask him, but whether adopting his opinion or not is another thing. 🙂” … Me Too!